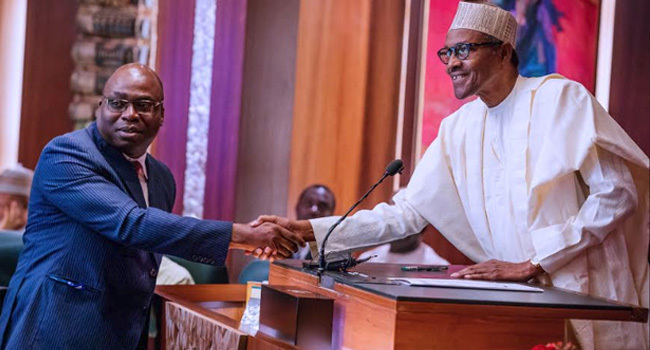 President Buhari Swears In Bolaji Owasanoye As New ICPC Chairman – President Muhammadu Buhari has sworn in Professor Bolaji Owasanoye as the Chairman of the Independent Corrupt Practices and Other Related Offenses Commission (ICPC), 7 months after sending his name to the National Assembly. The President likewise introduced 8 new individuals into the agency while the promises of office were given. The individuals are Delta, Enugu, Anambra & Lagos. Others are from Katsina, Jigawa, Niger & Nasarawa including a young agent who is 27 years of age. The swearing-in service was taken on Monday at the gathering councils of the Presidential Villa in Abuja. President Buhari charged the ICPC authority to think of precautionary tactics & plan of action that will help recognize MDA’s likely to fraud.